1-2 tablespoons of minced fresh Italian parsley. Place one to two inches of water at the bottom of a large pot, and heat the water. Wash the outside of the clams with a brush or new sponge and cold water to remove any sand or sediment on shell, discarding any clams that are cracked open. Place the clams in the large pot. The clams should not go higher than three quarters of the height of the pot otherwise the liquid will steam out of the covered pot. Bring the heated water to boiling, and cover, steaming for about 8-10 minutes, or until the clam shells begin to pop open. Remove the pot from the heat. Take the meat of the clams out of the shells using cooking tongs and place the clam meat in a separate bowl. Toss the shells and save the clam liquid in the pot. Take a bowl and place a paper towel in a strainer and hold it over a clean empty bowl. Pour the claim juice through the towel and the strainer to catch any sand or natural debris that has settled into the juice through the steaming process. After all clam meat has been removed and placed in a bowl, the clams need to be cut up. I prefer to use a food scissor for this step instead of chopping the clams on a cutting board. With this method, the clam pieces remain firm and do not get mushy. In a small pot, add one and one half tablespoons of olive oil and heat and add the chopped garlic. Cook the garlic for a few minutes on medium heat so it begins to soften but not brown. When the garlic is cooked add the clam juice into the pot. Keep the clam juice on medium heat until the broth begins to boil. Add the chopped parsley and let it cook for a few minutes and then add the chopped clams and remove from the heat. To a boiling pot of water, add one pound of linguini pasta and cook until the pasta is “al dente.”After the pasta is cooked and drained, put the pasta back in the pot and add some of the clam juice to the pasta to prevent it from sticking. Take a serving of pasta and add it to bowl. 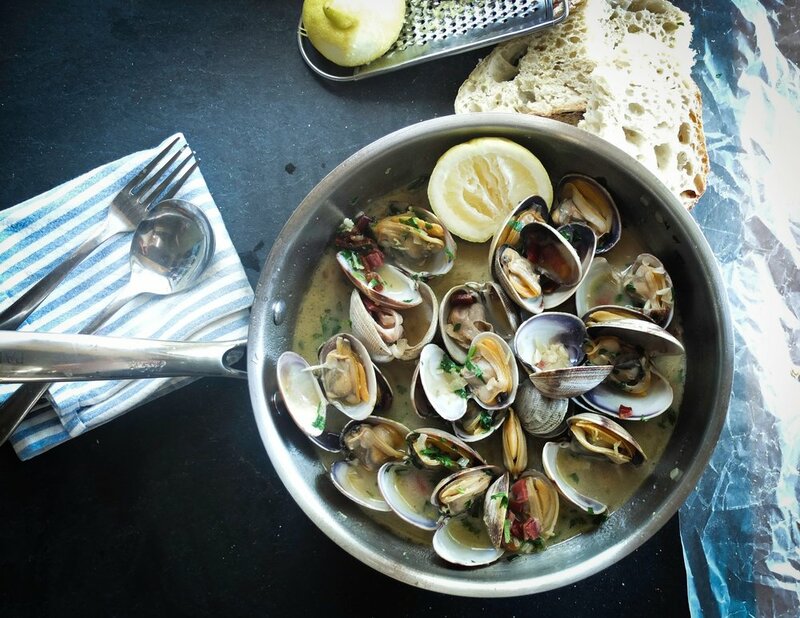 Take a ladle filled with clam juice and clams and pour it over each serving of pasta. Grate some Parmesan cheese over the top of each bowl. All you need is a great loaf of bread, a glass of wine and enjoy! Photo by Alexandra Burke. She adds the shells back as garnish. Anyone who grew up in an Italian household, especially with an Italian mother, will know what I mean when I say that as I grew up, anywhere I turned there was likely food coming my way. “Try this. Taste that.” Not surprisingly, some of my very first memories are happy ones of being with my mother and grandmother in the kitchen. Mary, my grandmother, was “Nanny” to us and her passion was for baking. She lived with us when I was growing up, so naturally she was a fixture in our kitchen and always had coffee, tea and always a baked good of some kind for us. It probably won’t surprise you to hear that having a sweet tooth also runs in the family, and I’ll claim the title of “Big Tooth” on that one. Lucky for me, the apple didn’t fall far from the tree because my mom, April, loves to bake as much as her mother. She amazes me with what she creates in the kitchen. We joke that she needs to start selling her cookies (she makes over a dozen kinds!) come the holiday season. One day we will make it happen. While I have a long way to go before I could even begin to claim the same level of baking skills as my mom and grandmother, they passed their love for baking on to me and I love to roll my sleeves up and get baking as often as a I can. One of the first recipes I tried on my own was for an Italian Love Cake that my mom passed along; it came from my grandmother originally. It is a delicious combination of light, airy and just the right amount of sweet and goes so well with a cup of coffee or tea. I first made this cake while I was living in DC and working as a consultant for one of the big four firms. After I made the cake for the first time, my mom suggested I had to bring a cake in to work. So, I did. Our team had been working long hours on a deadline, everyone was tired. But it’s amazing to see what happens when you bring a still-warm cake into a conference room. It was a hit, even my clients enjoyed it! I was reminded that homemade food, particularly a sweet baked good, speaks a universal language that can bring us all together. Just the kind of thing that can lift spirits and sprinkle a little positivity in the day to keep us going. More recently, there’s been a new chapter to this baking story. About seven years ago my wife discovered she had a severe gluten allergy. At the time, we thought that would put a damper on the baked goods and sweets, but my mom has taken this on as a personal challenge. She’s now set out to re-mix many of our favorite recipes, sans gluten. No surprise: She’s crushing it. Having watched many moments in the kitchen between my mom and grandma that will always be magic memories for me, I’ve come to realize that the key ingredient in being a successful baker is the love that goes into it. The happiness warm cookies or a fresh pie can bring to family, friends and loved ones cannot be measured but the stories, conversation and connections it can lead to will last a lifetime. Oh, how sweet it is! Preheat oven to 350°. Prepare the cake mix as directed and spread the batter evenly in a well-greased and floured 9- by 12-inch pan. Using a hand mixer or whisk, mix the ricotta cheese with 3 eggs, 2 teaspoons vanilla and ⅓ cup sugar until well blended. Spread cheese mixture on top of the cake batter. It will sink to the bottom during baking. Bake at 350° for 50 to 55 minutes. The top should be a golden brown, and a cake tester or toothpick should come out clean when done. Let the cake cool. 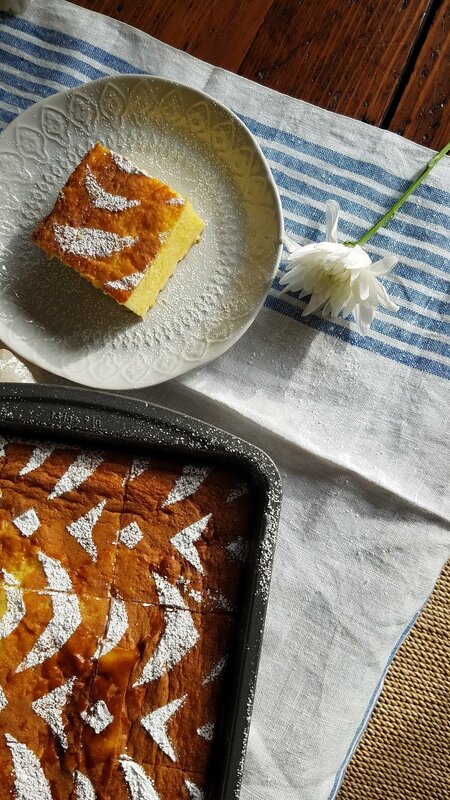 Finish by dusting the cake with powdered sugar and then cut into squares. Enjoy a piece (or two) with your favorite cup of coffee or tea. *Note: This is the “quick recipe” that uses a boxed golden cake mix.